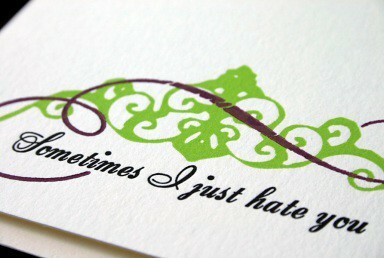 These remind me of these weird, adorable cards I used to see at a store called Paper Moon in Dallas in the late 90's. They would have this weird animal creature on the front, and inside it would say things like, Just because you gave birth to me that doesn't mean I have to answer your calls. Or, You know what you did. The flowers are in the trash...next to your clothes. They were more clever and devestating than that, though. I wish I had bought them because I haven't seen them in a few years. 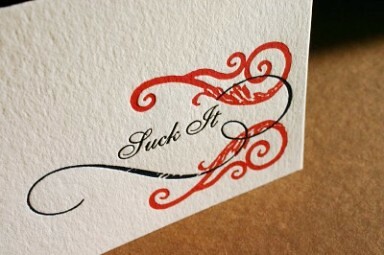 I was turned on to this site by the letterpress studio who helped produce the cards. I know you don't post these until you read them so don't post this, just correct it. Humorous is spelled with an o, not an "e".